Love it or hate it (seriously, how could you? ), Space Quest III: The Pirates of Pestulon is a classic parser-driven graphical adventure game, and a truly fine, funny, sci-fi, satirical, death-filled moment in the long history of Sierra. 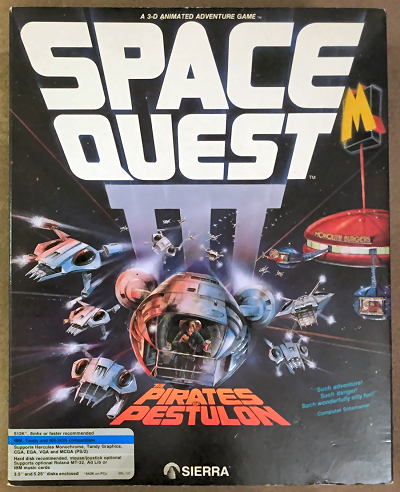 It is also the last Space Quest game designed by both the Guys From Andromeda, and, as you'd expect, a game you can buy via this Space Quest III (MS-DOS) eBay auction. It is the excellent MS-DOS/Tandy version of the game you'll be bidding on, and it comes on both 3.5" and 5.25" disks, complete in its finely preserved box. By complete, I do of course mean the box includes the manual, the hintbook (with its "adventure window"), warranty card, Sierra catalog, punch out Death Ray Shield Mask, coupons, brochures, letters and some notes.